Finally the last lot. Well actually pop back soon, I did some bits and bobs for all. I decided to do something for NSD, and reach out to all the scrappers in a way that was personal and meaningful to them. I strongly believe in anything that builds bridges and breaks down barriers between different cultures and countries. I hope one day for a world where there is peace and safety for all. So in any way I can I will strengthen the connections and find the shared experiences and desires we all have. Scrapbooking achieves that in many ways, we are all celebrating our lives, our families and our achievements. We are not so different no matter how we say friends. 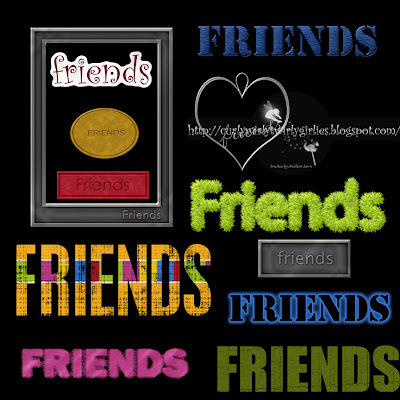 So in fourteen languages, and twelve different styles, there is one meaning – friends. These freebies have been shared on the understanding that they are not to be re-distributed in any means (including QPs). You may not share the files through any means, anyone interested in downloading them is to be directed to this blog. These freebies have been made using the actions available for purchase or downloading from Atomic Cupcake and brushes from Obsidian Dawn. Comments and feedback are encouraged and appreciated and you can download them here. Please remember your manners. Thanks so much for each and everyone of these. Great set. Wow.... what a downloading frenzy (just kidding, hehe). I have to say thank you for the french, english, german and spanish word art. These are fabulous!!! Thank you so much for sharing another great addition to the ABC kit! Fantastic words, I love all the variety, thank you.